When I wrote my post last week, “Learning to Love Your Post Pregnancy Body” (click here for that post) I got a lot of comments from people saying that I must not have extra skin from my stomach getting stretched out. With all of my posts I have always tried to be as transparent as possible and post things as they really are. I don’t photoshop my pictures, and I’ve posted a whole bunch of pictures that are kind of embarrassing or scary to share with people (stretch mark photos, post baby belly photos, no makeup photos, etc). And even though I feel really vulnerable when I post these kinds of pictures, I think it’s important to share because these are things that so many moms struggle with post-pregnancy but I feel like no one ever talks about it!! I gained 60 lbs with my first pregnancy and somewhere around 50lb with my second (I stopped weighing myself at the end because it kept messing with my head). 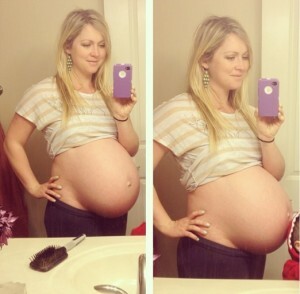 When you carry two babies, especially two very big babies, your stomach goes through a lot! I got stretch marks on my belly and hips (with this pregnancy I got a ton of stretch marks but they were clear instead of purple like with my first pregnancy so they aren’t as noticeable in pictures). And, the integrity of your skin changes. The skin on my stomach is a little softer (if that makes sense) and not so tight. My little girl is 2.5 months old now, and I still have a lot of saggy skin and extra fat on the bottom of my tummy. 1) It is normal for your stomach to looked a little stretched out after you have a baby! After all, it did get stretched! 2) Even if your stomach is bigger and saggier after you have a baby, it doesn’t mean that it has to stay that way forever. You can get your stomach back in shape with proper nutrition, it just takes time and dedication. And I’m not talking any kind of crazy fad diet, or insane amounts of exercise. I’m talking about eating whole foods, exercising 4-5x a week for 30-60 minutes, and finding a balance with your treat meals. I know some people leave the hospital looking like they did pre-pregnancy but that is rare and not the norm. Most women still look pregnant when they leave the hospital. In this article here, I talk about the top 5 things I work on to lose the baby weight. I am also exclusively breastfeeding and that helps too – you can burn up to 500 calories a day just by breastfeeding. I’m working on a post right now with tips and things you can do with your nutrition if you are brand new to eating clean and just starting out. Keep checking back here, I will have it posted in the next couple days. 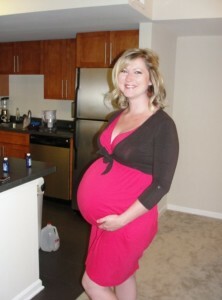 3) There are certain clothes you can wear to make your post-baby body look a little better. Let me give you an example. These two pictures were taken yesterday about 10 seconds apart! My baby girl is 2.5 months old. In the first picture my pants were pulled up over my little tummy pooch I have right now, and I am wearing a pair of pants that doesn’t have a very tight waistband. In the second picture, the only thing I changed is that I pulled the pants down lower. In both pictures I am flexing my stomach, but right now when I flex I get that sort of flat-pancake look with the extra skin/fat on my lower tummy. This will go away over time, but it’s definitely still there right now. Crazy how just adjusting your pants a few inches can make such a difference!! -Look for pants that have more forgiving waistbands. I look for things that aren’t really tight in the waist or that have a wider waistband so it doesn’t dig into the extra fluff I have on my tummy and back right now. I also bought a few pairs of shorts that were two sizes bigger than I usually wear. It is never fun buying bigger sizes, but it makes me feel more comfortable wearing clothes that actually fit then trying to squeeze into my clothes that don’t fit yet. I like the Mossimo brand at Target – they have some super cute and bright shorts and bermuda shorts right now. Lululemon pants are also super flattering, but they are pricey (about $100 for a pair) so I have a hard time justifying getting a pair in a bigger size right now. -Because it is summer I am really into summer dresses. I love the floor-length empire waist casual dresses/maxi dresses. They don’t cling to my tummy and keep me cool in the heat. Most are strapless or have spaghetti straps so if you aren’t comfortable with that you can add a cropped sleeve jean jacket or a cute little shrug. Of all places, I just found a bunch of cute dresses at Burlington Coat Factory in the $10-20 range that are super cute! -Keep wearing your belly band. I am not a huge fan of the post pregnancy girdles because they are so hot and uncomfortable, but I DO like to use my belly band. If you aren’t sure what a belly band is click here, I got mine at Walmart for $15 and have used them through both pregnancies. I like using this when I have jeans on because it just looks like a layered tank but I don’t have to stress about my stomach showing if my shirt comes up at all. -When all else fails, wear a pair of Spanx. I got a pair of Spanx (I actually think they were Assets brand?) at Target for about $25 and sometimes if I am wearing a dress and I feel like my stomach is sticking out too much I will wear my Spanx. It just helps to sort of hold everything in and makes me feel more comfortable. They are hot and kind of a pain to put on though so I don’t wear it very often. Even though these pictures are kind of scary for me to share with people, I hope that I can be an example that having babies doesn’t mean you are doomed to have a big stomach forever. I know this because my stomach was really big and stretched after I had my first baby (looked like my stomach does now, probably even a little worse because I gained more last time) and with time, proper nutrition, and exercise I was able to get my abs to show again. Even when I was really lean I still did have a little bit of extra skin that showed when I bent over, but I noticed that once I cleaned up my diet and cut out a lot of processed foods the skin on my stomach tightened up a lot. My son had just turned two in this picture and it was about seven months after I took a serious look at my diet, cut out my processed foods, focused on whole foods, 5-6 meals a day, etc. Taken at the Arnold Sports Festival 2012 when my son had just turned 2. 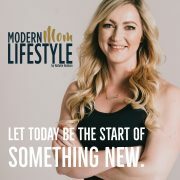 My hope is that by sharing these things with you that 1) we can start a dialogue where more people are comfortable talking about the changes that happen after pregnancy and 2) we can work together in getting in shape and losing the baby weight the healthy way. Maybe you just had a baby and can relate because your stomach looks like mine now (pink sports bra picture). Maybe you had babies a few years ago and are ready to work on losing the weight now that the kids are older. Maybe you haven’t had kids yet and are curious what might happen to your stomach after you do have kids. Regardless, I hope that this site and my social media pages can be a place where women can encourage one another and feel comfortable talking about these kinds of changes. Thank you for the continued support I get from everyone who visits my website and Facebook page. It is your support and inspiration that helps to keep me motivated. I appreciate you! 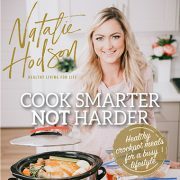 Natalie, you’re awesome!!! This was such a great post, I love your honesty and motivation. Youre a great role model for moms everywhere! Thanks for being so transparent! Thank you Amy!! It’s scary sometimes to show pictures that aren’t my best or most flattering, but I hope by sharing some of my thoughts along the way it can help other moms in their journey 🙂 Thank you for your support I appreciate you! Thank you for posting REAL pictures of motherhood! I am 25 and pregnant with my first baby due in september and although i am working out and eating healthy through my pregnancy its still scary as a woman to gain weight and see your body a new way! I really enjoy reading about your experiences post pregnancy. You look great!!! Thank you Jenn!! Congratulations on your pregnancy!! I always really like the second trimester because you are out of the sick/tired phase and not yet in the super-huge-i-can’t-do-anything phase 😉 It is crazy how much our bodies change when we get pregnant. The good news is that with good nutrition and exercise it can get back (or fairly close) to how it was pre-pregnancy 🙂 Good luck with the rest of your pregnancy! Can I just say I absolutely love your posts, your honesty, your no sugar coated information. I know it helps me to not be so hard on myself just reading what you have to say. Some of your points are spot on and remind me that I too carried two babies and I can get to where I want with changes to the most basic of things such as my diet. I really appreicate all that you have to say and I am always eager to read a new post. Thanks for sharing this with all of us. You seem to have a great attitude about these things and are a great role model for all of us. I’m no where near having kids but reading posts like these helps me think that getting back in shape is possible for all of us. (when the time comes 🙂 )Thank you! Thank you Joanna! That is my hope! I hope that I can show people that you can find a healthy balance between motherhood and staying healthy. Thank you for visiting my site! LOVE LOVE LOVE reading your posts!!! I am a 52 year old woman who didn’t get it until about 1 year 3 mos ago. My daughter became a NASM certified trainer a few months before I started working out and she has helped me tremendously. Unfortunately, time has prob made my tummy always to look like your second picture if my pants are pulled down, but seriously who sees that – just me and my hubby!! I am thrilled and happy with the way I look and THAT is what keeps me going. 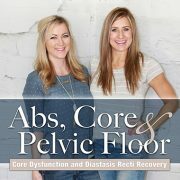 So all you you ones – get smart quick after you have your babies so you can get your tummy flatter than I will be able to. I love that I can pull up my pants or my bathing suit bottoms and hide my little pooch. That was something I was not able to do before I started working out and eating healhy. AGAIN – just love your articles, your recipes, EVERYTHING!!! Hi Natalie. I just wanted to say thanks for your posts! I started following your blog a couple of months ago through something I saw on facebook and have really enjoyed it. I have a two and a half year old and am due with my second child this Friday. I competed for the first time last summer in couple of regional npc bikini competitions shortly before I got pregnant this time. I worked out most of this pregnancy but some issues in the last two months have kept me out of the gym. As you know it can be very diffiult to watch muscles disappear under a layer of fat or from atrophy. You look fantastic already and it has been very encouraging to read your blog. You have a great attitude and give me hope for bouncing back again after baby #2. Thanks! Hey Erica! 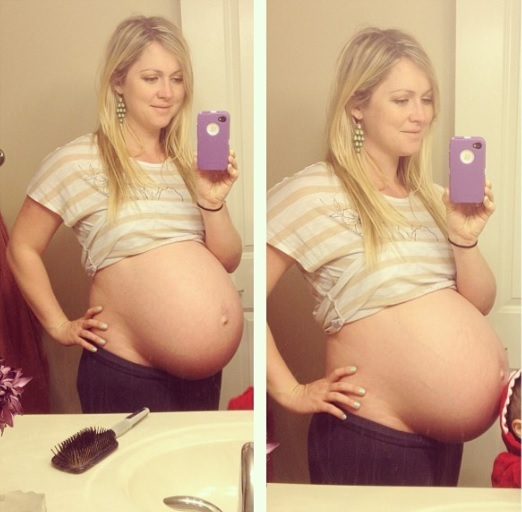 Isn’t it crazy the changes that our bodies go through when we are pregnant? We have so much estrogen flowing through our bodies that it’s hard to build or even hold on to much muscle, then add on fatigue, sickness, cravings, etc! Congratulations on your pregnancy! I am excited for you! I only recently discovered your blog and have been devouring the posts. As someone who hopes to get pregnant in the next few years, I really appreciate your honesty! You are great! Seriously… I really admire you for putting it all out there. It is how things are after a baby and it’s nothing to be ashamed about. These bodies we have are so amazing! They grow humans! And they can get back into shape too. I look forward to reading your next post. I’m 28 weeks pregnant and trying hard to keep eating well for the rest of this pregnancy so that it wont be such a transition afterwards… but it’s tough. I just try to remember that every meal is a decision, am I going to make it a good one or not! Thanks for your blog, I love it! thanks for this post. I have started working out and I have changed my diet. I have seen huge results in just changing my diet and cutting out junk food and processed foods. I have already lost 12 lbs in 5 weeks and I always think of you when I need a motivation boost. You are truly inspiring and your honest posts really help to see the things how they are and to realize that you CAN do something about it. I always tell my husband “if she can do it, so can I :-)”. I have wondered about my extra skin on my stomach (after three kids) and this post just motivated me to keep going. We have bought a home gym and tons of weights and I have been lifting weights and doing exercises every day. thanks for being such an inspiring woman! Thanks for sharing all this. I just had my baby 3 weeks ago – 9 lbs 4 oz. and my 5th and I’m feeling great! Wish I could start exercising, but I just need to sit tight and relax for a few more weeks. I really want to get my tummy looking better this time…I never seemed to get it very flat. I think cleaner eating is definitely in order this time!!! Do you have any nutrition tips or tips in general to help increase breast milk supply? Natalie, thank you so much for sharing everything you do! 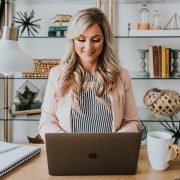 I’m 29 weeks pregnant (with my first) and have just found your site. It has been a HUGE inspiration to read the things you have to say! I only wish I had found it earlier when I was really freaking out about all of the changes my body is going through. 🙂 It’s so great and reassuring to see your honesty and know that we’re not doomed to a lifetime of a saggy body post baby. Keep up the great work! You are awesome! Wow, I am truly inspired! I started browsing the internet wondering if it was even possible to get a body like yours after just having my second child who is now only 4 months. Now I feel like I can. What I would like to know more of is what exercises you were doing, what were you eating, and routines I could follow. I look forward to reading and following your future blogs. Thank you so much for sharing. I now feel like I can accomplish this. I am a new myself of a, now, 6 month old! I have a question regarding stretch marks. My stomach completely blew out with them and I wondered do they minimize and does your tummy get less saggy looking once the fat is removed from the stomach area? How’d you go about doing that? Thats my biggest concern right now. I love this so much! My baby is almost 5 weeks old (I know give it way more time), he is my 3rd and I am a Personal Trainer and Fitness Instructor and can’t wait for this loose skin to go away, it’s hard post baby to look at your body and not see yourself (does that make sense)? And I know I need to give it much more time than 5 weeks, but I needed to see this as a reminder to not be so hard on myself, to stop battling with myself and in time as it did with the 2 others, I will be back to my post baby self. Thank you for sharing, I am so glad I found this!